Infineon Technologies AG and Giesecke & Devrient GmbH (G&D) have jointly developed a new production method for chip packages specifically for use in chip card applications. The FCOS (Flip Chip On Substrate) method is the first in which a chip card IC is rotated or flipped inside the module housing it. The functional side of the chip is attached directly to the module by means of conductive contacts; conventional gold wires and synthetic resin encapsulation are no longer required. The new attachment technique saves space in the module; additionally, it is even more robust than the conventional wiring solution. This means that the whole module handles high mechanical stresses better like those encountered, for example, when a chip card is sent by post and passes through the postal system’s sorting machines. Removing the need for the wiring used in existing methods frees up space in the module, which is therefore able to accommodate a larger chip. Typically, the standard maximum chip size has been around 25 square millimetres. Using the new technique, it should be now possible to add extra functionality to the card relatively quickly, without the time- and cost-intensive space optimization work typically required in chip development. Alternatively, the space savings provided by the FCOS method can be used to shrink the modules in which existing chips are housed. Smaller modules are already in demand for certain applications. The European Telecommunications Standards Institute (ETSI), for example, approved a smaller form factor for SIM (Subscriber Identification Module) cards in mobile phones at the beginning of 2004. ETSI wants to see dimensions of just 12 mm x 15 mm in future, a specification for which the smallest possible modules will be required. Infineon’s responsibilities in the FCOS project included the fundamental development work, the design of the module and the development of the production method for FCOS modules. Both companies then brought their expertise to bear to ready the FCOS technology for practical chip card applications. G&D contributed its knowledge of chip card production, built the new module into the card body and conducted all of the card qualification tests necessary to confirm its suitability for high-volume production. Infineon and G&D will each market FCOS independently. The new packaging technology has passed its practical test. Infineon provided the more than 70 million FCOS modules which G&D integrated into prepaid phone cards already in circulation in Mexico. 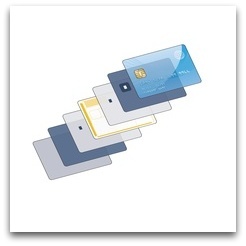 The FCOS method is in principle suitable for use in all types of chip card including not only prepaid telephone cards and SIM cards for mobile phone network access, but also healthcare cards, personal entitlement cards for access to official services online, bank cards for electronic payment and company ID cards. Conventional chip packages are currently around 580 micrometer (µm) thick on average; FCOS modules not more than 500 µm. A human hair, by way of comparison, is typically around 80 µm thick.